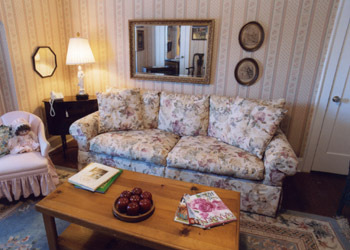 Rooms are spacious and feature original built-in cabinetry and sitting rooms. Each room is beautifully decorated with antiques. All rooms have private bath, cable TV, telephone, internet access, and private deck with an incredible view of the surrounding countryside. Relax on your private deck overlooking the well-manicured garden. The garden has many sitting areas tucked here and there. The Inn has a charming, two-bedroom cottage in the rear of the Inn. White picket fence, front porch, and comfortable décor make it very popular. The cottage has a completely furnished kitchen, cable TV, telephone, and lots of charm. The library is a favorite of most guests. Relax in the antique leather chair, enjoy the view of the lovely gardens, and read until your heart's content. Some of the books in the library are from the Hanson's originalcollection. Guests enjoy a full gourmet breakfast in the sun-filled dining room while viewing the peaceful surroundings. Breakfast begins with a fresh fruit dish with homemade muffins and is followed by a variety of sumptuous main courses. Breakfast served to accommodate your schedule.